I haven’t posted in a while because I have been working a lot. My job has been super stressful lately and there doesn’t seem to be an end in sight. When I get home, I’m exhausted. If I have energy at night or on weekends (after my kid is sleeping), I am trying to focus on house projects. Since those projects have been consuming my very limited free time, I have neglected my blog. So tonight I am going to post a little bit about my home projects and how I am trying to deal with the stress of so many unfinished projects. Rather than solely concentrating on the restorations, my husband and I have somewhat turned our focus elsewhere. Our jobs have been taking up a lot of time and work has been spilling over into what would typically be our personal time. Also, I have taken a bit of a break from full-out restorations to finally start focusing on decor. I didn’t realize how time-consuming it would be to decide what type of furnishings and decor will work and fit in each room. In order to stay within the budget, I have to choose which items are most needed and look for the best deals. Things are slowly coming along. For example, I am so excited that after two years, I finally found, bought, and hung some curtains. I had some rods sitting in our attic, so I decided to use as many of them as I could. Some of them were too long, but it was nothing a hacksaw couldn’t handle. 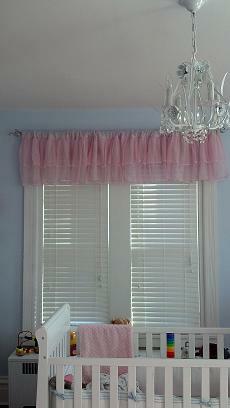 Chrome rods and pink valances in the nursery. 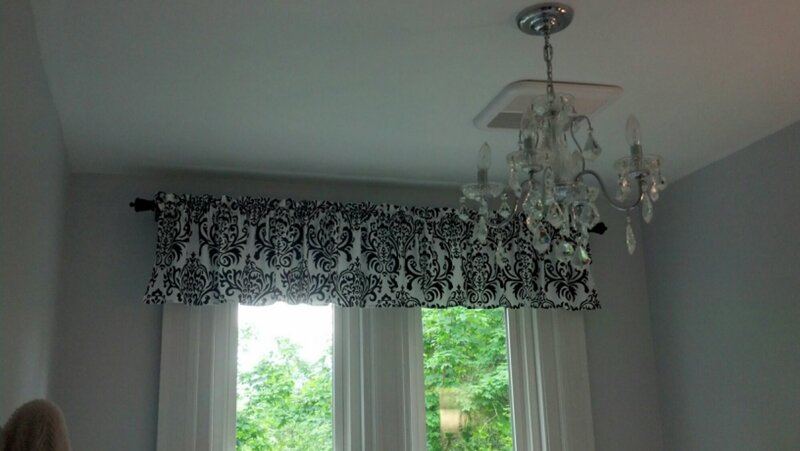 Black and white valance and a black rod in my daughter’s bathroom. Rust rods with sand curtain panels in the master bedroom. I have also started work again on the staircase. The staircase has come so far over the last two years. There was a point when we didn’t even have spindles or a banister. It was straight up scary climbing the stairs without a banister. Now I just have to finish the newel posts and make stair brackets. I hope to finish the staircase in the near future and post some pictures. I am really proud of this huge and beautiful project. I have also been working on the pocket door restoration. I almost have one set of pocket doors completely finished. I have been working on both pocket doors off-and-on for about eight months. There are a total of 120 windows on the pocket doors that have to be taped, primed, painted, scraped, and cleaned. Ugh. With how long this has taken, I don’t even feel like starting on the second set of doors. Finally, we began work on the third floor. I installed hardwood floors for the first time and, surprisingly, it actually wasn’t that hard to do. We are paying someone else to put in an asphalt road leading to our house. The muddy, gravel road just hasn’t been working for us, so we are finally getting it paved. This whole process of save money, do some projects, save more money, do more projects really slows things down. We can’t get to projects as quickly as we would like. It seems like I never get anything completely finished. I am trying to do so many different things at once that I can’t ever fully focus on just one task. I have to do things quickly, while thinking about the next task I need to do. It’s frustrating and stressful, and I worry that I miss things, forget about things, and make mistakes. However, the most important and pressing tasks get done. I’ve had to learn to let things go and accept that things aren’t going to be perfect. My options are accept it or have a nervous breakdown. I’m trying to accept it and not really look around my house because focusing on the mess that is my life will only make me freak out. I’ve just learned to accept that my life is full of unfinished projects. So that’s where I’ve been the last month and what I’ve been doing. I’m hoping that work will ease up a bit in the next month or so and I can focus on my blog again. I’m trying to make it all work! **This is a link-up post for “Whatever Wednesday.” This link-up is hosted by Sarah at Thank You Honey. Feel free to check out her fabulous blog! This entry was posted in Home and tagged Hanging Curtains, House Renovations, Prioritizing Projects, Working Mom by Candid Mama. Bookmark the permalink. Instead of saying you’ve been “neglecting your blog” you can say “I made the intentional decision to focus on the things that were most important to me.” 🙂 It sounds better and is less guilt-inducing. Your progress is beautiful! Great work. I like your version much better!!! Thanks for checking out the progress. I have to get around to posting pictures of the big projects. Hubs and I are proud of the work that we’ve accomplished so far. Listen, I’m in awe of everything you’ve taken on and can completely understand the sense of being overwhelmed that understandably comes with it. Just an attorney job on its own (not to mention a toddler) keeps your plate full, I had no idea you were managing a business with your husband as well. Hats off to you. Big time! Thank you! I kind of bit off more than I could chew. We all have our own struggles though. It’s funny! I’d been wondering if you had blogged recently because I hadn’t seen one of your posts in my feed for a while; I meant to swing by; and sure enough – I see that life has kept you wonderfully busy in other ways. It sounds like you have made some good progress on the restoration and that life is busy right now and that there’s a lot on your plate. I completely understand the stress of feeling like you aren’t getting things done – but it certainly looks like you are! As for the save/reno/save spiral – we know it well. We are still recovering from last year’s bathroom reno. 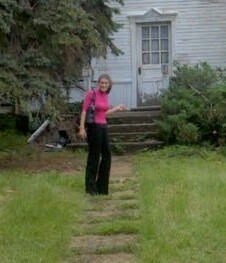 I figure we’ll be ready in another two years or so for our next – and probably last – reno project on our house. I can’t believe how time got away from me. I looked at the last time I posted and I couldn’t believe it. I am hoping to get back to posting soon! Renovations are such a PITA! 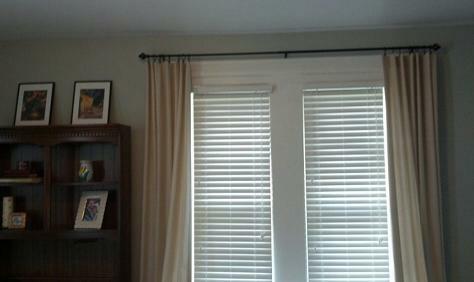 I am glad to finally be at the hanging curtains phase in some parts of the house (after 2.5 years). I feel the same way about my blog. It gets neglected, but us full-time working moms have a lot going on. I have a long commute too. Sometimes I think if I could just kill off the commute I would be so much more productive. I can dream, right!? Your progress looks amazing! Thanks. It has come a long way since having the interior walls torn out. That was a low point.